← A funny post about Wine Geeks. Enjoy! 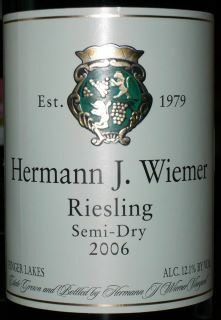 HIGHLY RECOMMENDED: Hermann J. Wiemer 2006 Semi-Dry Riesling, Finger Lakes, NY. $18. 12.1% ABV. This summer, we have enjoyed several different Rieslings. They have all been delicious, yet they have all been radically different from each other. Some sparkling, some still—some sweet, some dryer than Champagne! Frankly, Evan Dawson’s book “Summer in a Glass” got me off my duff and into the Riesling aisle, and this has been a very good move indeed. (To read my review of this book, please visit http://www.thefrugalwinesnob.com/?p=416—it’s one of the best books I’ve read in ages.) And, the wine I’m sharing with you now hails from the Finger Lakes region, the subject of Dawson’s book. Hermann Wiemer emigrated to the U.S. from Germany, with 300 years’ family winemaking background in his genes and personal experience. He planted his winery’s first vines in 1973, at a time when New York State was producing uber-sweet plonk. One of the pioneers in New York State’s fine wine-making, Wiemer had a tremendous influence in his area and ultimately nationwide. The owner/winemaker today is Fred Merwarth. The winery has been winning awards for years, and this year is no exception, with the vineyard landing on the Wine & Spirits Magazine 2011 list of the Top 100 Best Wineries. (Interestingly, so did the Schloss Gobelsburg winery, the producer of another entirely different Riesling which we will review here shortly.) The operation has 65 acres, 40 of which are planted in Riesling, and produces 5,000 cases/year. OPENER: Cork-sealed, but it had a little pull-tab, so a foil-cutter wasn’t necessary. Nice touch. I don’t see this very often any more. COLOR: Gold. Darker than I’d expected it to be. NOSE: Mild, subtle aromas. Honey. TASTE AND MOUTHFEEL: Very mild acidity. Soft and soothing. Smooth and gentle. A hint of stone. Floral. A bit of apple. FINISH: Slightly tart—more tart on the finish than in the mouth! Yeast rolls. A slight taste of mild lemon candy. I learned something about wine tonight. I think it’s the same kind of thing women wish men would learn about us women, and vice versa. Here goes. In another wine I might have called it “flabby,” because it is so very gentle and smooth—well-balanced, and kindly, maybe even simply, flavorful—but such a description simply isn’t fair, as “gentle” does not mean “weak.” No, this wine was more like one of those quiet but world-stopping kisses that remain in one’s memory for a lifetime. LABEL NOTES: These elegant and distinctive wines come from our vineyard in the beautiful Finger Lake region of upstate New York. Hermann Wiemer was born in Bernkastel, Germany into a family with a 300 year tradition of making fine vinifera wines. He came to this country well-steeped in the knowledge and tradition of winemaking and high quality vineyard practices. In 1973, he selected for his operation a strikingly beautiful property on the west shore of Seneca Lake, recognizing the similarities in soil and climate to that of his native Mosel region. Hermann Wiemer’s unique ability to combine the tradition and skills of the old world with the vigor and modern techniques of the new has quickly established his reputation as a leader in producing high quality wines which are recognized throughout the world. WEB NOTES: Hermann knew it would work. At a time when few believed in the potential of vinifera varietals, when most thought that the harsh western New York winters would kill the noble vines, he believed that Riesling and Chardonnay could thrive on the western side of Seneca Lake. Hermann had emigrated from Bernkastel Germany, bringing with him over 300 years of family winemaking tradition. When he first planted vinifera vines at the HJW vineyard in 1976, his experience convinced him that the lake would protect the vines, the roots of the vines would make themselves at home in the rich shale-dominated soil, the grapes would ripen with a good balance, and the wines would be the testament. It is in pursuit of Hermann’s determined philosophy that we combine the best of old-world viticulture practices with sustainable modern techniques in our nursery, vineyard, and winemaking and ensure that our wines embody the finest expression of our vineyards. COLOR-golden; NOSE-great fruit; little Honeycomb cereal; some apple; steely flinty action; TASTE-nice golden apple; little hint of residual sugar; very crisp and clean; great backbone dryness on the back-end; very solid and clean; little mix of apple and blue stone on the back-end; little hint of sweetness. This entry was posted in Finger Lakes, NY, Riesling. Bookmark the permalink.